When it comes to COFFEE, especially any leftover nectar, I refuse to waste it. With a culinary degree under my belt, inspiration reigns supreme. I’ve found interesting uses for that dribble of dark stuff left-over in my brew pot. To this day, I seldom throw out any leftover coffee. I usually pour it into a small glass jar and store it in the fridge. 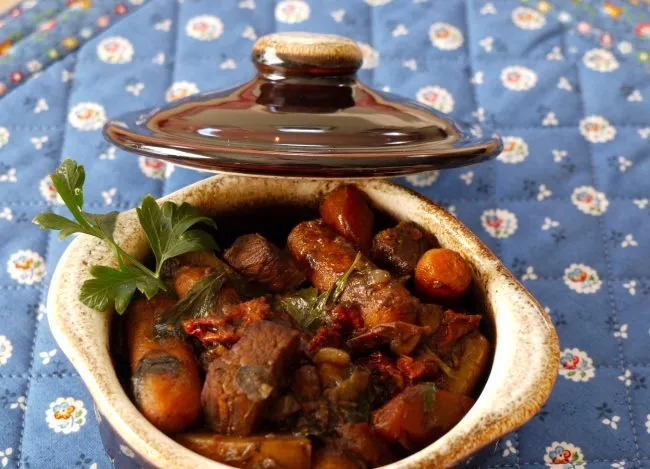 Once when I was making a savory beef stew, I sheepishly threw in that leftover ¼ – ½ cup coffee. Wow, what a surprise, in lieu of super homemade beef stock, that little bit of coffee added a nice deep richness to my tasty stew, the coffee flavor was unidentifiable. Now, I wouldn’t make beef stew without it. 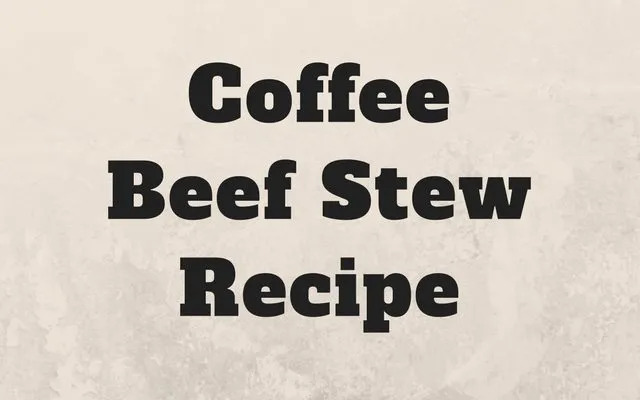 Summary: Recipe to make a beef stew with a coffee inspired broth. To season and flour the meat, put the beef and a little seasoned flour in a paper sack or plastic bag; shake until coated in batches, and the job is done! Continue with the recipe. There is one suggestion here, if you opt to cook this in a crockpot, rather than on the stovetop, take the time to brown the meat carefully for the reason cited in the next sentence. Brown meat on all sides in hot fat, turning often, letting a nice fond develop. Fond is the brown bits accumulated on the bottom of a crockpot during the browning process. Liquid is then added to “deglaze” the pan and form a concentrated flavoring. This step enhances the formulation of a great complex, flavorful final product. Add water (liquid of your choice, coffee water, stock, to measure 4 cups), lemon juice, Worcestershire sauce, garlic, sliced onion, bay leaves and seasonings. Cover, and simmer, do not boil, for two (2) hours stirring occasionally to keep the mix from sticking. Remove bay leaves, peppercorns and any other whole seasonings you’ve included. Add carrots and onions. If carrots are large, halve or quarter. Cubed potatoes may also be added. Cover and cook 30 minutes longer, or until vegetables are tender. Remove meat and veggies, thicken liquid for gravy, if desired. Garnish with some chopped parsley. Gravy: Skim most of the fat from stew liquid. For 3 cups liquid, put 1 cup water in a shaker or mason jar with a top, add 1 cup A.P. flour, shaking until smooth. Add the flour mixture slowly to the meat stock, stirring constantly until gravy bubbles all over. Cook about 5 minutes more, stirring often. Pour over meat and vegetables. J.B. is a resident of the Tucson, AZ area and is a member of the University of AZ, Cooperative Extension's Master Gardener Program. J.B. writes for the Pima County Master Gardener Newsletter, exercises hard earned culinary skills, plants cactus in the garden, and spends a great deal of time attempting to be a reasonable photographer.